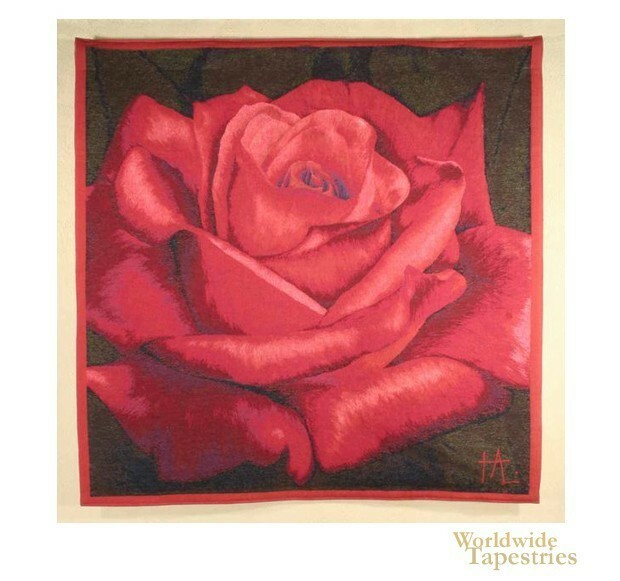 Like its companions piece, "Grand Rose", this floral tapestry "Grand Rose Red" shows a red rose bloom as a close up. Floral still lifes has been a most popular subject for tapestry art in France and Belgium alike, and here we see a red version of the rose with its folds opening out. The r=red rose is set on a dark background for dramatic effect. This floral tapestry "Grand Rose Red" is backed with a lining and has a rod pocket for easy hanging. Dimensions: W 57" x H 56"